HTC teases a 'handsome' phone announcement for September 6th, say One A9? 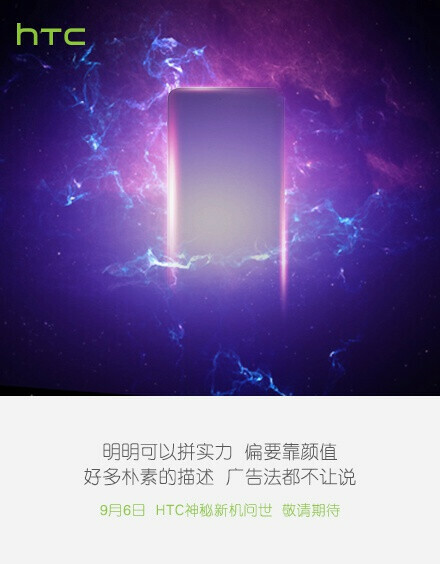 HTC just posted a teaser on its local Twitter account in China about an upcoming "handsome" phone that will be unveiled on September 6th, it seems. Given that CEO Cher Wang assured investors back in the beginning of the summer that we would all speak again in October, when the company will be releasing a "hero" device, that could be the one she was talking about. The only upcoming flagship from HTC that we are still waiting on to appear is the rumored One A9 "Aero" handset, so on Sunday we might very well hear something more official about it. As a reminder, besides a deca-core Helio X20 processor, the HTC One A9 could feature a Quad HD or 1080p display, 4 GB of RAM, and an enhanced rear camera with support for RAW photography. The handset might appear on AT&T, and will allegedly cost around $500 - $600, which puts it in the premium segment, so we can't wait to see the actual specs and design in a few days. Only HTC phones without a middle camera that I can think of are the Sensation and the Nexus One. Well Nexus one should not be included, although it is an HTC phone, the design and specs were dictated by Google. Yep, HTC finally moved the iPhone 6's camera to the middle. Aero actually is a mid range device. It does NOT have 4GB Ram. It has a 1080p Display Uses a mid range Snapdragon Processor. PhoneArena stays reporting false info. Lol another PhoneArena believer. My problem with PhoneArena is they literally post and believe anything from sources that are not credible. Then they spew on as though its facts. 1. Mediatek will not be used for the A9. 2. I'll respond to you September 6th "PhoneArena know what they're talking about" - Big fat LOL you will see. Its a mid range device that will be priced accordingly. By chance, will it have a fingerprint scanner? And what type of software will it be running? So instead of giving me your sources, you brush it off and expect me to believe you? How about not being such an idiot next time huh? I agree, he is an idiot. it amazes me how many people make statements with no evidence or support for their statements. They post anonymously, & have nothing to support their claim, why should anyone believe someone with these credentials? Would it be a mid range device, if it performed as well as high end phone making their higher price and lager specs worthless and pointless? Yes, anyone can make a phone perform well with s**t 750p displays and candy crush light graphics and software. Like a motorcycle, performance is fantastic but it's still not a Ferrari. Candy Crush light graphics You are aware, the IPhone with its 2012 specs are able to handle more intense graphics than most 3 and 4 GB phones..
powerVR G6200 inside helioX10 is better than powerVR SGX554 inside A6X (2012).. so basically that cheapo redmi note 2 is more than enough, right? Yes, which is because of the s**t low res screen more than anything else. Well the iPhone renders 2k then downscale to HD.. the IPhone could easily handle a higher res screen and i would guess other low end phones could too. RAM doesn't matter, if you're good with management you're never going to have a problem. 2 or 3GB is more than plenty. 1080p doesn't matter. Anything beyond 300 can no longer be distinguished at normal distance. It is using a deca-core Helio X20, not a mid-range Snapdragon. Its NOT using a Helio Chip. I'll return September 6th just to show how wrong you are LOL. How about showing us your sources you moron? I COULDNT SHOW YOU MY SOURCES BUT I CAN NOW SHOW YOU EVLEAKS BASICALLY CONFIRMED WHAT I SAID GOOD BYE. I don't see how 1080p is relevant for specs.. It might be a test for the Mediatek deca-core Helio X20 processor. If performs well, it may prop their entry into higher grade smart phones. Its good to see HTC to attempt to do something better than staring at their destiny. I like that turned to MediaTek chipset. They should call it the Ace! It would be a play on the word "One" plus "Ace" sounds cooler and rolls of the tongue better. Same reason RIM chose the word Blackberry over Strawberry.